The Golden Fire gasification burning method produces pure and superior heat effect. Unlike cast fireplace materials in ceramics, the uniform, oriented and natural Mammutti type of soapstone conducts heat rapidly into the structures of the fireplace. This ensures that heat is captured and stored efficiently. You can burn wood rapidly at a high temperature without having to lose the generated heat up your chimney. Its excellent thermal conductivity, outstanding heat storage capacity and superior heat resistance characteristics make the Mammutti type of soapstone the supreme source of comfortable warmth. 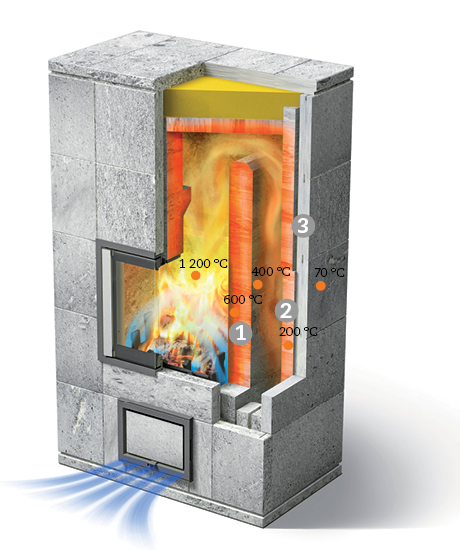 The Golden Fire gasification burning method ensures the clean burning of all heat-storing NunnaUuni fireplaces. Mammutti soapstone conducts heat quickly in the direction of the foliation and more slowly against it. This relationship between thermal conductivity and the direction of the foliation in the stone is used in our fireplace structures to ensure optimal heat release. The NunnaUuni fireplace structure, made entirely of soapstone, has a high heat storage capacity. The fire chamber is built from fine-grained, oriented Mammutti soapstone, which, thanks to the brown periclase that forms on its surface, is highly heat-resistant. The direction of the foliation is chosen in a way that ensures the rapid transfer of heat into the deeper layers of the fireplace. A considerable portion of the generated heat is already captured for storage inside the fire chamber. The direction of foliation within the smoke ducts corresponds to that found inside the fire chamber. This way, all of the remaining heat can be captured close to the fire chamber. Mammutti soapstone conducts heat quickly in the direction of the foliation and more slowly against it. This relationship between thermal conductivity and the direction of the foliation in the stone is used in our fireplace structures to ensure optimal heat release. The surface layer is built using oriented Mammutti type of soapstone allowing heat to travel parallel to it. This, in turn, ensures that the entire fireplace structure radiates heat evenly into the surrounding room.